Are Team Associations A Good Thing? Before you read this, please understand that I really know nothing about the topic I am about to discuss. I am probably about as qualified to write about brain surgery or splitting the atom as I am to discuss team associations and satellite operations. So if I make you shake your head in disgust as you read this…you’ve been warned. This past Monday night, I came across an article by Marshall Pruett that described how Harding Racing is in discussions with Michael Andretti on possibly creating an arrangement where Harding Racing would run their operation in association with Andretti Autosport. The headline caught my eye for several reasons, and I can’t decide if this is ultimately a good or bad thing for IndyCar racing. Harding Racing ran three races last season, two of which produced Top-Ten results with Gabby Chaves at the wheel, and things looked very promising for the new upstart team. With Al Unser, Jr. involved and Brian Barnhart running things – the future looked bright. They moved into the old Ed Carpenter Racing site on Main Street in Speedway, which gave the team plenty of space to grow. Mike Harding spoke of growing his team the right way and Harding Racing appeared to be a prototype on how to start a race team from scratch. But reality crept in as the one-car team struggled mightily against the multi-car teams. Single-car operations that are full-time constantly have their backs against the wall, when it comes to gathering and sharing data. Ed Carpenter Racing, AJ Foyt Enterprises and Rahal Letterman Lanigan Racing were all one-car operations that just recently expanded to two cars for that very reason. Gabby Chaves was part of the last one-car operation that tried to make it on its own, on a full-time basis – Bryan Herta Autosport (BHA). Their first crack at a full-time season was 2012, when Herta hired Alex Tagliani to drive his Barracuda entry with Lotus Power. The Lotus engine was in the back of the car for a total of three races. The team skipped the São Paulo race and by the time the Month of May rolled around at Indianapolis, the team had Honda power. For the next four seasons, Herta struggled to keep his team afloat. Two-thirds of the way through the 2013 season, Tagliani was out of the car and Luca Filippi was given four races: Mid-Ohio, Baltimore and the double-header at Houston. JR Hildebrand drove the car at Sonoma and the season finale at Fontana. Hildebrand matched the team’s best effort of the season when he finished eleventh at Fontana. For 2014, Herta plucked Jack Hawksworth out of obscurity and put him in the cockpit, with promising results. But by this time, BHA had lost the Barracuda sponsorship and struggled in sponsor searches all season. When Foyt expanded to a second full-time car in 2015, Hawksworth went with what looked to be a more stable situation and left BHA for Foyt’s team. It may have been more stable, but the results for Hawksworth were disastrous. He toiled at Foyt for two years before being mercifully let go at the end of the 2016 season. His IndyCar career may never recover, but I digress. When Hawksworth left in 2015, Herta chose rookie Gabby Chaves. With sponsorship from Bowers & Wilkins, Chaves had a very impressive rookie campaign with BHA. But when 2016 rolled around, BHA needed a lifeline to stay afloat and Michael Andretti provided it. Herta merged his team into Andretti’s and the team officially became Andretti-Herta Autosport with Curb-Agajanian. Unfortunately for Gabby Chaves, he was out and Formula One refugee and rookie driver Alexander Rossi was in. The week of the Honda Indy Toronto, Harding announced that Gabby Chaves was out of the car temporarily in order to evaluate other drivers for a second car for next year. After two races with Chaves on the sidelines, Conor Daly is the only driver that has been in the cockpit. He had a good run at Toronto and had another good run going at Mid-Ohio, but ran out of fuel on the last lap sending him to a twenty-second place finish. With sidepods that have said Harding Racing for every race and Valvoline on the rear cowling for only a few races, I have an idea Mike Harding’s wallet is a little lighter than it was a year ago. I have no clue how deep his pockets are, but racing is one of the quickest ways to turn a large fortune into a small one. I’m sure he could appreciate a lifeline, and it appears one could come from Michael Andretti – just like he did with Bryan Herta almost three seasons ago. It’s also public knowledge that Andretti Autosport may form some type of association with McLaren, should they decide to expand into the Verizon IndyCar Series. Would they do both? If so, would the McLaren association have two cars? Would the Harding association, as well? What does an association mean, anyway? Does Andretti Autosport provide technical data? Do they set up the car? Do they just provide space? Does the associate team have any separate identity from the main team, or is it just an extension? The first association I can remember came in 1996, when Marlboro Team Penske wanted to run only two cars. Al Unser, Jr. was only two seasons removed from a championship season and his second Indianapolis 500 win. Paul Tracy was returning to the team after a year at Newman/Haas. The problem was that Emerson Fittipaldi was still under contract. At this same time, Carl Hogan was in the process of breaking away from partner Bobby Rahal. Out of nowhere came a “satellite” team of Penske called Hogan-Penske Racing with funding from Marlboro Brazil. 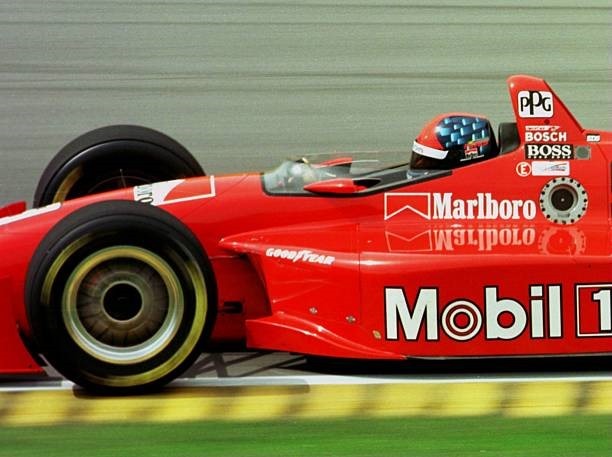 The solid red Penske chassis had Marlboro just below the cockpit, but had Mobil 1 on the sidepods. It was not a match made in heaven. It didn’t look like a Penske car and apparently didn’t drive like one either. The best showing for the satellite car was two fourth place finishes at Nazareth and Milwaukee. The only other Top-Ten finish was a tenth at the infamous US 500 at Michigan. The Hogan-Penske effort with Fittipaldi behind the wheel was averaging a finishing position of 16.08 when Fittipaldi suffered career-ending injuries in CART’s second trip to Michigan that season. Jan Magnussen finished the season for Hogan-Penske with similar results, the lobe bright spot being an eighth-place finish at Laguna Seca. The next “association” I can recall was a satellite team for Tony Kanaan fielded by Gerry Forsythe in 1999, after Tasman Racing closed up shop. Forsythe already had his two Canadian drivers, Greg Moore and Patrick Carpentier, driving for Players. But Forsythe had some type of arrangement (that I’m a little fuzzy on) with Steve Horne and Tasman to run a third car for Kanaan with McDonald’s sponsorship. The partnership actually yielded decent results. Kanaan earned his first career win at Michigan and finished eleventh in points. Beginning in the 2000’s, we’ve seen several one-off programs for the Indianapolis 500 being run as associate programs. Alex Lloyd comes to mind. In 2008, he ran with Rahal-Letterman in association with Chip Ganassi Racing. The next year, he ran with Sam Schmidt in association with Ganassi. When Dan Wheldon won his second Indianapolis 500 in 2011, it was with Bryan Herta Autosport in association with Sam Schmidt. Dreyer & Reinbold have fielded cars in the “500” in association with several teams; Richard Petty Motorsports, Kingdom Racing and Panther Racing. They’ve all been just a little too convoluted to keep up with. But they were all one-offs at Indianapolis, so it really didn’t matter that much. But when Bryan Herta formed his association with Andretti Autosport in 2016 for the entire season, things got really confusing. Was it an Andretti car? Was it a BHA car? Who prepared it? Who called the shots? I had no clue and still don’t to this day. All I know is that Alexander Rossi drives a full-fledged Andretti car, while Marco Andretti drives the No.98 Andretti-Herta entry, although Rossi carried the NAPA sponsorship to the No.27 car. So this season, there are three Andretti Autosport cars and one Andretti-Herta Autosport car. Next season, there is the possibility that in addition to those four cars, there may be two McLaren-Andretti cars and an additional one, or two, Harding-Andretti cars or whatever they will be called. Is it possible that the Michael Andretti footprint may involve eight cars on the grid next season? It sure looks that way. My question is…is that a good thing or bad thing? If you’re Mike Harding, you’re probably thinking it’s a good thing because it infuses your program with cash and gives you an opportunity for sponsorship you never had before. It also gives you access to team data and the engineering prowess of Andretti Autosport. If you’re Chevy or Honda, you probably don’t care for it. Harding is currently a Chevy team. If they were to move under the Andretti umbrella, they would have to switch to Honda. Honda may or not be excited to add more cars to their stable. Chevy is probably not anxious to lose a team. Right now, Chevy has Team Penske who is a threat to win every week. But their other teams are teams that are not that accustomed to winning; Ed Carpenter Racing (ECR), Foyt, Carlin, Juncos and Harding. ECR last won in 2016. Foyt’s last win was in 2013. Carlin, Juncos and Harding are all relatively new and have never won in the Verizon IndyCar Series. Maybe Chevy would be excited to jettison one of their start-ups. Who knows? But from a fan’s perspective, I don’t think it’s good to have only a few teams control the bulk of the field. In the 2017 Indianapolis 500, Chip Ganassi racing had four cars, Team Penske had five and Andretti Autosport had six. Fifteen cars, or almost half the field, were owned by three teams. It’s hard to articulate just why that’s bad, but it just can’t be good. If Michael Andretti has an association with eight cars, and he is suddenly out of racing for whatever reason – there goes a third of your field at most tracks and a fourth of your field at Indianapolis. I like to hedge my bets better than that. Is Michael Andretti smarter than the average bear? Why is he so willing for multiple partnerships, when other owners aren’t? Other than the failed Hogan-Penske experiment in 1996, I’ve never known Roger Penske to be willing to associate with any competitors. Who’s right? What is best for the series? What creates the largest car count? In today’s climate, is this the new normal? There are so many unanswered questions regarding all of these potential associations with Andretti Autosport, I don’t even know where to begin. But if Michael Andretti has his hands in eight different programs and a tough decision needs to be made regarding his primary three (or four) cars, the two McLaren cars and one or two Harding cars – I’d like to be a fly on the wall. It could get very interesting. This entry was posted on August 6, 2018 at 4:04 am and is filed under IndyCar. You can follow any responses to this entry through the RSS 2.0 feed. You can leave a response, or trackback from your own site. One note, RE: Penske “associate” teams: in 2007, Ryan Briscoe (who was driving Porsche LMP2s in ALMS for Penske’s team that season) ran in the Indy 500 for Luczo Dragon Racing, partially owned by Roger’s son Jay, and using equipment leased from Penske Racing. This association lasted just the one race, because by the time LDR ran a partial schedule in 2008 for Tomas Sheckter, they were using their own cars. As far as “associated” teams go nowadays, I’m sort of lukewarm on the idea, as I’d prefer to have, say, 12 healthy 2–car teams on the grid than 6 4-car teams (the worry of one team pulling out and cratering the starting grid is a legitimate one), but if a team like Harding is struggling to exist (like BHA was a few years ago), I’d rather that team get pulled under the umbrella of a bigger team, in favor of that team just going away entirely. If Harding has to take on the Steinbrenners or McLaren as a partner for 2019 (not that I’ve read a ton about the situation or have any inside knowledge, but I think the former is a more likely scenario than the latter, mostly because Colton Herta will most certainly move up to IndyCar with George Michael Steinbrenner for 2019, but McLaren still seems very much on the fence), I’d much rather they do that than close up shop entirely. Anything that can stabilize the car count in the mid-20s every race and level up a team toward the front of the grid (because Harding running around in 15th or so every week isn’t a whole lot of fun to watch) is a welcome development, as far as I’m concerned. Not how good these associations are, but I think maybe they are a must for new 1 car unsponsered teams. Is there danger if the big team pulls out, you bet there is. The big plus for small new teams is the tech know age and the boost in finding sopport, (sponsor). I don’t think chevy wants to loose anymore teams. Penske did have an association with Patrick Racing in 1989 and, I think, with Tony Bettenhausen’s team in the early 90s. Bettenhausen ran year-old Penske chassis for several years in an apparent association. The 1989 Fittpaldi-Marlboro-Ganassi-Penske horse trading deal is well-documented. Perhaps these relationships were not close enough to be considered an association. I won’t refuse anything that keeps cars on the grid, though far too often “associations” result in the smaller team simply getting absorbed into the bigger team. I cannot think of a recent association of the type that Harding is apparently discussing with Andretti that has not ultimately resulted in the eventual and complete dissolution of the smaller team. HVM ran EJ Viso in association with Andretti in 2013 and then disappeared from the sport. Sarah Fisher’s association with Ed Carpenter lasted all of one season before she too was out of the series. Bryan Herta does not seem likely to strike out on his own again. It would be nice if these associations were how new teams were born instead of how struggling teams decompose. Off topic: It may be a testament to George’s clout or whatever (keystroke memory? )that when I now do my thrice weekly “Google” search for “Oilpressure.com”, I only have to type in “Oilpres” and boom, I’m immediiately in Nashvul where speed is life. Note: Do not try a Google search for “Oily George” as that will only take you to the “Oily George Espresso Bar on Georgetown Road. Free association comments here without any apparent connection to today’s topic of association. Our George operates an Expresso Bar on Georgetown Road ? ? ? No. The name of the drink is the “Oily George”. I’m with SpeedGeek, I’d much rather have healthy, independent teams than these associations, but if my choice is between associations and the new teams folding I will gladly accept the associations. But man, Michael Andretti must have very broad shoulders, they carry almost the entire weight of the IndyLights series and a sizeable chunk of the IndyCar series. If his company were to fold it would be a catastrophic blow to open-wheel racing in this country. Agreed. Michael is and has been as much of an asset to open wheel racing in this country as those other two guys. And he was not responsible for the demise of the Milwaukee Mile here. I can say that because I live close to the track and witnessed first hand his promotion efforts. have Tide and Gain and other duplications? it works.